Off Season Bride: Will I Change My Name? "It'll be so weird when you change your name," said a friend recently, quite casually. "She's not changing her name," shot back another friend, before I could even reply. "She would never change her name." I started working on this post, and Groupon sent this out. STOP IT, BIG BROTHER, YOU'RE TOO OBVIOUS NOW. "Well, I might, but I might not," I said, and they both stared at me, equally shocked. That's the truth, or at least, that's a snapshot of the truth, right now. But now moves quickly, as does truth. And when it comes to the name game, the whole truth is a trickier and constantly-evolving little beastie. Truth, Then: Despite being raised by a feminist mom (who hyphenated her name, by-the-by) and open-minded dad, I still grew up assuming that someday I'd grow up, find Prince Charming, marry him, and then we'd be the Charmings. Truth, Now(-ish): I'm really attached to my name. I have several publications attributed to this name, a solid professional reputation linked to it, more than three decades' worth of largely-positive-associations with this moniker - to say nothing of, like, Twitter and stuff. I've done a lot as this person, called by my name. It's understandable that my close friend (several, actually) was shocked I would even consider changing my name. Plus, I'm certainly a feminist, progressive person who balks at the idea of having my identity somehow become adjunct, deferring and docilely submitting my own name and allowing it to fade into oblivion as I now don my husband's name. Yet, objectively, am I any more or less a part of the patriarchal system if I keep my dad's last name, as opposed to taking my chosen partner's last name? Still, even if it trotted its way down a patrilneal path to get to me, my name has now been mine for thirty-two years. After this much time, I have claimed it, shaped the perceptions associated with it, and giving it up seems ludicrous. So as of a few weeks ago, I made the decision - and even announced to a few close friends - that I would be keeping my name. And then, yet another chatty friend said, in front of The Fiance, "So, like, are you keeping your name or what?" I just stared at her for a second. Poor thing had no idea how big a question she'd just asked, especially since she asked it of me, and my mind has thirty thousand thoughts swirling around in it on a slow day. Luckily, The Fiance, who is rarely at a loss for words and always quick to look out for my feelings, took the opportunity to make this lovely statement: "Oh, I pretty much assumed that you would want to keep your name, and that's totally fine with me, of course. I don't see it as any sort of litmus test, does-she-love-me-enough-to-take-my-name or anything. Anyway, it's a good name. (Says my full name.) I love that girl." And right then, I realized that dammit, no litmus test required, I do want to share a name with him. The feminist in me pouted, but then she got a little less petulant and a little more poignant about it. It's still my choice, after all, and isn't that what it's all about? Not the ultimate choice we make on issues like this, but the fact that we're empowered to have our own choice in the first place? People change names to mark transitions. When someone takes on a new faith, or confirms their faith, they often receive a new name: a Hebrew name after conversion to Judaism, a Christian name after baptism, heck-- the Pope gets a new name when he gets the big gig, and far as I know there haven't been too many lady-Popes. So it's not just a gendered thing - although speaking of gender, trans* persons go through the process of finding themselves a new name that honors their identity. 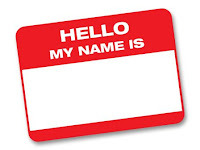 People change their names for plenty of other reasons: to advance their career, to better reflect their personality, to mark themselves in some way as something different from how they felt encased in their old name. I do believe that marriage will be a transition; that something about my identity will shift, though I will remain autonomous and very much myself. I will be committing, publicly and wholly, to throw my lot in with another person's, and create a new family. (Let's not even open the issue of having the same last name is easiest if there's kids - this post is already looooong.) It is a transition, and thus many things will change - but will my name be one of them? The Inconvenient, Clock's-Ticking Truth: I still don't know. At the moment, I'm considering hyphenation for daily life, but maintaining my current name as my professional name. I still don't have a final decision... but I did buy that Groupon, just in case. What are your thoughts? 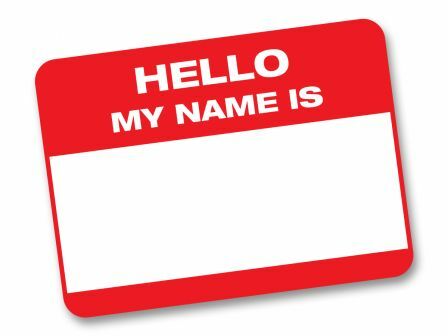 I'd love to hear from folks who took their partner's name, folks who kept theirs, who hyphenated, whose partner took their name, folks who changed their name due to another change or transition in their life... What was this decision-making process like for you, and when (if ever) did you "know" what the right name would be? So, I decided to just go with the traditional Miss Manners method of dropping my middle name, using my former surname as the new middle, and adding his as the new last name. And I've gotten three thousand tons of push-back ever since from people who think I ought to have hyphenated or kept my original middle name & dropped my original surname or whatever other solution they think best. Which means that no matter what you choose to do, there will be people who disagree with you vehemently. Sadly, even if you decide later that you wish you'd done it differently, immediately after a wedding is the only time that it is even remotely easy to change a name (and that, only for the woman in our current society). Oh, and I've never liked my original first name. Much, much too common and not even an interesting common name. Or particularly feminine (which, while I may not be stereotypically female, I've generally felt comfortable with my assigned gender). My poor mother searched so diligently for a name that wasn't common and then apparently a gazillion other mothers-to-be all came to the same conclusion between 1968 and 1975 for both their little boys and their little girls. Although certain family members insist that only people who learn Monique first think it fits better & that even those people are probably only saying that to make me happy.... See? No matter what you do, there are always going to be some people who just refuse to be happy about it. From the husband angle, I told Rachel I'm fine with either--the kids getting the patronym (and not a hyphen, which either forces your kids to choose or else leads to Roman levels of logorrhea) was the thing I was ready to fight for. 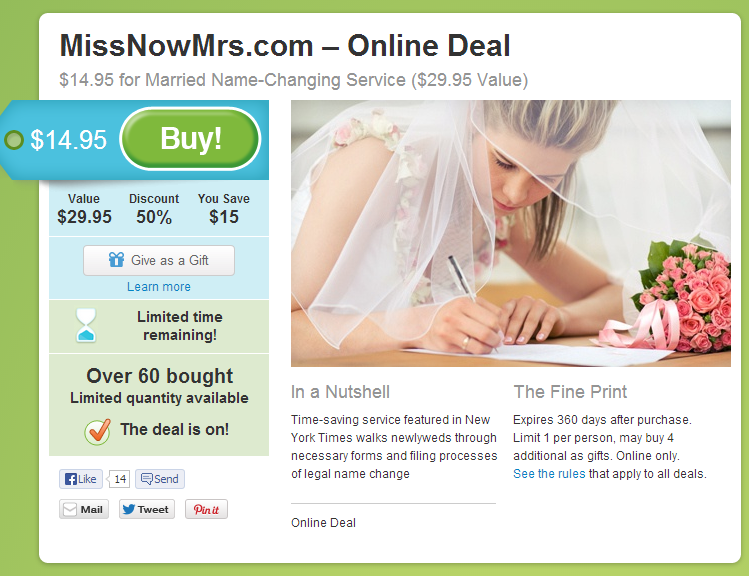 I did offer to change my middle name to her last name but the gesture wasn't worth the paperwork. I thought she'd move her last name to the middle but she literally just forgot to do it on the application and we shrugged and said whatever. The big thing really is how it will affect your career. How often do you generate business/opportunities out of name recognition? That ought to be the primary concern. At least that way you can put an estimated dollar value on the change, and then decide if you'd "buy" it for that much. This is just one of those areas that got more complicated when we started injecting modern sensibilities concerning individuality into a cultural tradition that was meant to serve a group mentality. Best not to think so much about the patriarchal, chauvinist, woman-as-extension-of-man reasons we started passing down dad names, and just do it because it's normal and doesn't mean anything unless you force it to. Unless you care that your ancestor was a Boucher, Baker or Chandler a name doesn't mean rub-a-dub-dub to anyone but your family and whatever you or they have made of it recently. Selfishly it's hard to keep track of all you gals now that you've become Rosenbergs and Rappaports and Lichtensteins (at least you picked a cool name to marry into). Thanks for chiming in with a husband-perspective; one of your insights there did point to another issue - "the kids getting the patronym" being what you were "willing to fight for"... particularly when a woman is close with her family, as I am, what if that's what *she* wants to fight for? I'm a little jealous that my brother's already-burgeoning little family will be full of kids with our last name - while raised in a more religiously-observant household, where matrilneal descent holds certain sway! On a lighter note, I'll close with my LOL-response to the final line of your comment, to which I thought "Dude knows a lot of chicks who married Jewish dudes." 36 years ago I kept my name and have never regretted it. We hyphenated the kids and truth be told - they couldn't wait to get rid of that long name and take their husbands' nice short and easy to spell name! It has created some interesting situations. When a caller asks for Mrs. Bober or Mr. Lukens, we know it's a telamarketer and just hang up! But the best happened when my oldest daughter, now 35, was in kindergarten. I know the story to be true because a parent was in the classroom at the time and was laughing so hard she had to leave the room and call me. In Kindergarten, my daughter Jody was the shortest kindergartener in the class. Her teacher proclaimed one day - "Bober, Lukens, Lukens-Bober, all these last names are so confusing I am just going to call you Jody Bober." The littlest kindergartener in the room drew herself up as tall as she could be and said "My mommy says that the only person who has trouble with our last names is the man who pumps out the septic tank." We never heard about the hyphenated name from school again! True, DPH :) Honestly, your union is one of the ones that makes me think most of changing my name, just because that united and easy sound of "we're going to the Hs" sounds so much cozier than the awkward and clunky "we're going to the D and Ks," or maintaining what folks now say, which tends to be just our first names: "Danny and Beth's place"... and there's something nice about that one-name, one-home verbiage. As a side note, I should probably work on "without thinking too much" a little more frequently in my life... but you know me! My wife and I wanted to have the same name, but neither were very attached to the one we had. They also weren't names that meshed very well, and we didn't want to hyphenate. We talked about coming up with a whole new name, but nothing was feeling right. She took a piece of paper and tried every combination of the letters in our names, and then it was just there and perfect. Such great comments! I got in late tonight, but will respond individually tomorrow.., sweet dreams, y'all! Hey, Beth. I suppose I'd better chime in, as one of the few women in the U.S. whose husband took her name. It's pretty unusual. To say the least. For the reasons you wrote about in your response to Diana, not to mention the whole what-to-name-the-kids question, I feel lucky. Yes, my sweetie's a true feminist, and yes, with regard to bucking the patriarchal system, I tend to fall on the side of those who reason that "my name has been my name my whole life, so keeping it is a whole lot different, gender-politics-wise, from taking my husband's." But really, it isn't about gender politics. Except insofar as it's a feminist victory for women to have so many options regarding this aspect of our identity. Whatever you want to call it, I think what's most important is what feels right to you and how you want to introduce yourself. Because ultimately, that's all you can control--there will always be those who call you what they want, no matter what's on your driver license, twitter handle, engraved stationery, or anything else. And Monique's right: there will be people who judge you no matter what. And I say, no one has any business judging you, period. It's one of those supremely personal choices. So let it go. You don't owe anyone anything in this regard. And there's no time limit, no clock ticking, on the decision (remember KR-R's fb post). Ok, maybe before you pre-purchase your engraved memorial stone for your pre-purchased burial plot, you should make up your mind. Personally, I totally get why women take their husband's names, and believe me, if it weren't for my conventions-be-damned, not-very-attached-to-his-last-name husband, I'd have been wishing I were one of those women who can't wait to take her husband's name. There's something very cozy, for me, about sharing a family name. On the other hand, some of my greatest friends and role models keep their own name, separate from husband and kids, and never once have I thought of them as less connected with their family unit because of it. Final thought: your only limit is your imagination. Check this one out: I have a friend who kept her name when she married her husband, who also kept his name. But when they had children, because they're raising the kids Jewish and she has the typically Jewish name (he converted, as it happened, though as we know there are born-Jews named Smith and Southern Baptists named Rosenblatt), and because she is professionally high-profile in their community and he less so, and for God-only-knows what other uber-personal reasons, the kids got her name, not his. They're doing fine. And so it goes, onward and upward. Have fun with it. Your friends will still love you no matter what. Just kidding. Thanks for the thoughtful comments. And thank goodness for friends who love you no matter what! I grew up with a different last name than my parents, because my mom remarried when I was very young. When I got married, I happily changed my name to my husband's, partly because I was glad to have the same name as someone else in my family. And partly because it's just not something I read into as much of a statement. I'm all into equal rights as the next girl, but sometimes, I feel like people who are shocked that a woman would even think of changing her name these days should just shut up already. Do whatever you want, but as a kid from a family with all different last names, I'm happy for my kids to have the same last name as mom and dad. I always had to explain, "he's my step-dad, but he's really my dad, because he raised me, we just don't have the same last name... blah, blah blah." Makes sense to me - and it is crazy, that sort of reverse-judgement of "how COULD you even THINK about changing your name?!" It's not as big of a deal to me now, but my mom kept her maiden name for a multitude of reasons (professional and personal) and I always wished my whole family had the same name. It was mostly just annoying to have to explain that my parents were not in fact divorced, but there were some times where it was an actual legal hassle. There's something awesome about being a family unit (even as a couple) that sharing a name can effortlessly convey. Just my 2 cents! Shortly after I was married, I was sitting in my sister-in-law's kitchen. With me were my sister-in-law, born Stein now Goldman; my mother-in-law, who was once Mrs. Stein but had been Mrs. Green for the past ten years; and my other sister-in-law, who was born Stein but had been 35 years Mrs. Rosen. A person arrived, knocked on the door, and asked, "Mrs. Stein? "-Three heads swiveled, eager to respond. None of the heads were mine, and I was the only Mrs. Stein in the room. I was pretty certain I wasn't going to change my name, but then I met Stephen Morgan and realized my name could be MEGAN (Stoner) MORGAN. Which is the easiest thing in the world to sign and also, as you point out, comic-book-style alliterative. So basically, do what makes you happy, society be damned.